Well to start out on sad note retention here in Brazil is 2%, but brighter it is much higher in our mission and even brighter, of my converts it is nearly perfect. I am very happy to see those photos; they are high quality and have satisfied my needs of seeing the family for now. 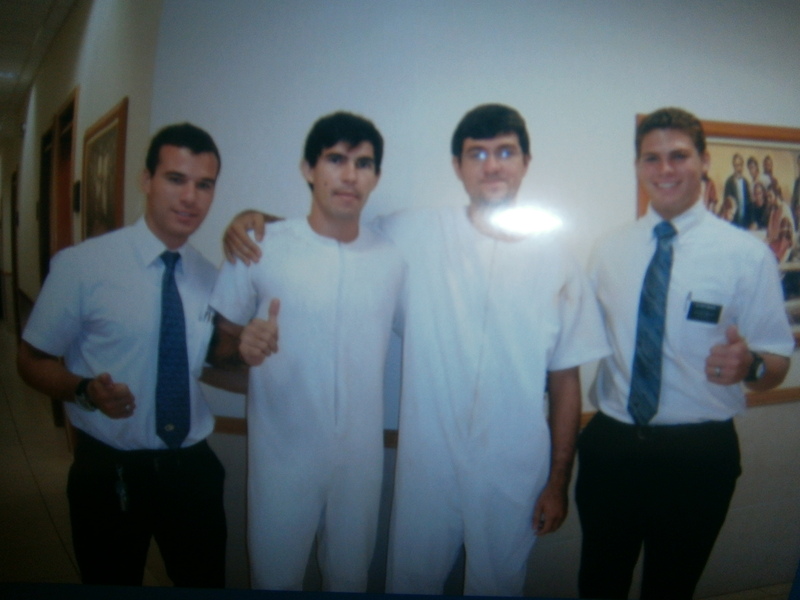 We also had a baptism this week, the brother of the ward mission leader, it was very cool and very fast and I have a funny story to share with all of you when I return home, let’s just say he was baptized 3 times and I didn’t get to see any of them. Unfortunately he will be moving soon though, in fact this week. But it is such a wonderful thing to be a missionary, I hope I can do all the Lord has planned for me here, I am gaining so much, I hope I am giving enough in return. I love you all and really hope the best for each and every one of you. I got the package from the ward! It sounds like a paradise there, I miss the snow. But it is also a paradise here because I got the package from the ward, what a great blessing, I had popcorn and root beer that night, and luckily Brazilians aren’t all that fond of root beer so I don’t need to share that part, and the socks are super comfortable and I love everything in it, the 12 days of valentines since it is valentines this week. I also got David’s letter and it seems like I get caught up then I read an email and everything has changed, but that is pretty super exciting. I really hope you all are doing great, I know dad is very talented and that everything will work out right. I am also very happy here right now because we have the leader of the missionary work in the ward here and he is the only member in his family, but recently one of our recent converts dreamt of bringing his brother to the church and since then has done just that and he will be baptized this week by his brother, it’s pretty awesome. We also had interviews with the president and after the interview I asked how my language was, and in response he asked if I knew elder M (who is a leader of a district) I said yes, and he then said I spoke better than him, and to prepare to be a leader, so I believe I will no longer be junior after this transfer, but even better I can speak a second language. How exciting to have a dream come true. Well the ward is strengthening, it has gone through some hard spells because of the building being moved pretty far away and not finding one here for them, they’re a little unexcited because of that but they are getting excited again and we are having a lot of success. I hope all works out while you prepare for the wedding and I hope the selling spree happens, I know the art is definitely worthy it, I saw his new one and it made me happy just looking at it. I also just remembered that during skype you said you found someone for me but all the others said no, who might that be, just curious because of the reactions. it is weird that you are grandparents now, you look so young. and also I think my recently baptized convert wants to buy us shoes so that might not be necessary, that Lord is looking out for me here. you have no idea how great the mission is and it is amazing how much we can learn and grow in such sort time. Also that 13 year old girl is already past Jacob in the book of Mormon. It’s pretty cool. Well for the first time I reviewed my email to you because I happened to have the time today, and I realized that it is written very poorly and for that my others are also probably just as bad, sorry. But I am getting even worse with English. Transfers also occurred and I will be staying in the same area and with the same companion, which will be 6 months now, so I will get to see even more happen here and the development, I am very excited. Also we invited two people last week to baptism during the first lesson and they very eagerly accepted. Very Cool. And we also played ultimate Frisbee, that was pretty great to, the juniors won. But Once again, love you all.